Ancient building techniques will be practiced by continuing the construction of a log house that was started in 2017. The main focus will be on the upper part of the walls and the roof. Additionally, logs will be barked, a doorway will be cut into the walls, and several doors will be built to the already existing buildings such as the smithy and the barn. The construction will take place using only hand tools: an axe, a hand brace, a drawknife, a knife, and a chisel. Techniques such as measuring and cutting corner joints and long grooves in the logs, and splitting logs will be practiced. 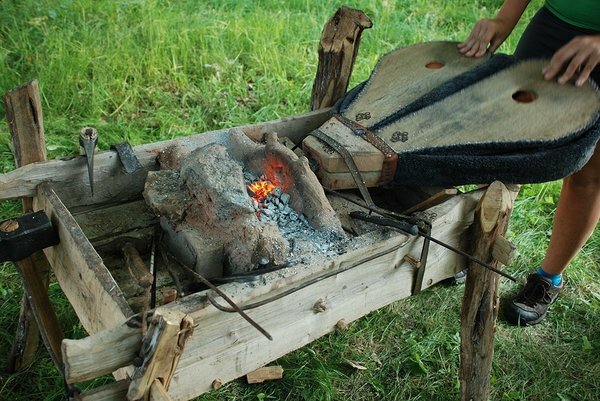 An iron smelting experiment will also take place. Other activities such as cooking, javelin throwing, basic smithing and tin casting will also be practiced as secondary activities. The participant will pay 10 euros per every full day spent at the summer school for food and accommodation. The food and accommodation fee is voluntary if the participant wishes to provision him- or herself (shops nearby). Accommodation is according to the preference of the participant: in the Rõuge Community house (on the floor space; toilet and shower available in the house) or in the ancient farm (bench/floor in the main building or in the barn; bedding hay provided). Personal sleeping gear is necessary in both cases. For registration send an email to: ragnar.saage@ut.ee specifying the dates of participation. Students from the University of Tartu can participate in the course of “Practical Training in Ancient Techniques” (HVAJ.01.004) to receive 3 ECTS. For people outside of the University, it is possible to get 3 ECTS and an official certificate from the University of Tartu, if you participate at the summer school for at least 5 days. The last option is voluntary and costs an extra 50 euros. On the verge of the pristine Ööbikuorg (‘Nightingale Valley’) at Rõuge, Estonia, the Viking Age farmstead is celebrating its second theme day dedicated to ancient lifeways and experimental archaeology. The activities will be led by archaeologists, craftsmen and other specialists. Craftworkers from both Estonia and neighbouring countries will be selling their Viking-inspired crafts and designs. We’re excited to welcome everyone with an interest in ancient customs and lifestyle so come along with your friends and family! More details coming in May. A small participation fee is charged for the workshops. Download the advertisement in pdf-format. On the 22nd of July 2017, the ancient farm compound built according to the traditions of our ancestors and located just next to Rõuge’s Ööbikuoru valley will become home to a theme day dedicated to ancient living conditions and experimental archaeology. A peek into a Viking hillfort and farm household. Free entry. Participation fee charged at the handicraft workshops. The workshops will be held by archaeologists, craftsmen and other specialists. We welcome everyone with an interest in ancient customs and lifestyle. Bring your friends and family! 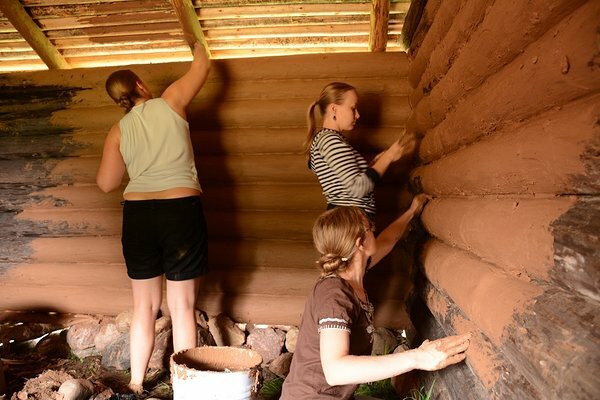 The ancient construction techniques’ workshops taking place from the 10th until the 21st of July will teach the participants to make doors for the smithy and granary, begin construction of a barn, repair the roof of the dwelling house with birch bark and fix the summer kitchen. During the two weeks, the participants will be able get to know the different stages of building a wooden house, starting from laying the stone foundation of the barn to finishing the complete building. Thematic workshops introducing different handicrafts will also take place in addition to construction work and will teach the participants to make educational items based on archaeological finds. The participants of the experimental archaeology workshops are mostly archaeology students from the University of Tartu and students from the University of Tartu Viljandi Culture Academy, but also other volunteers interested in traditional handicraft. All activities in the ancient farm during the two weeks of construction and workshops will be open to the public and the scientists, handicraftsmen and volunteers will be happy to talk to all visitors. It is possible to spend the night in a sleeping bag on the floor of Rõuge Community Centre or the ancient dwelling house. Bring your own sleeping bag or bed linen.